I oppose all wars that are not in the national interest and condemn them as a waste of life. The wars that Britain has fought in the last fifteen years – Kosovo, Sierra Leone, Iraq, Afghanistan, Libya – leave me perplexed. They are all liberal-interventionist wars. Wars waged by a nation convinced of its own goodness and purpose in the world. At least, that is the picture that we like to present to the world. It is far more complex than that. It is complex because our leaders hold only vague ideas about the reasons why they go to war. They do not fully understand their own motivations. Among their motivations is the motivation to do good in the world – liberal-interventionism in its truest sense. We can say that liberal-interventionism is the product of left-wing, liberal governments. The Left, since the 1960s, has strove to cast off the old, conservative morality of Britain and replace it with something new. That something new includes liberal-interventionist wars. The old morality was patriotic and parochial; it was about self-restraint and self-denial. Such concepts are anathema, are alien to the liberal Left. Hence the new morality of the Left tends to be remote (e.g., it adopts the Palestinian cause, desires to protect us from terrorist bogeymen in caves, wants to send more charity abroad than is sensible) and embraces abstractions that are beyond proof (e.g., climate change). The Left’s morality is morality-at-a-distance. Once the Left gained is first proper purchase on power in 1997 we saw – and continue to see – a trend of liberal-interventionist morality. A trend that David Cameron’s Conservatives have continued in Libya – Confirming my assertions that the Conservatives have made so many concessions to the political Left that they are undistinguishable from a left-wing party. The modern politician’s impulse to wage liberal-interventionist war is quickened by their apparent inability to think deeply. Our politicians today are taught to think and speak in buzzwords and soundbites. So, when the sweet-scented jasmine of the Arab Spring Revolution tickles their nostrils and they exclaim “Democracy! A good thing!” and must participate in it. These liberal-interventionist wars are confused. There is a good-intentioned, if misguided, morality but simultaneously there is a trumpeted self-importance: Our political leaders need to be seen as major players on the world stage. (You might wonder if Blair and Cameron had even heard of the Suez Crisis, if they think we can still dictate terms to the world’s troublemakers). But all these motivations for war do not explain our selectivity in fighting liberal-interventionist war. Why, if we are so concerned with abuses of human rights and oppression, did we not intervene in Zimbabwe? Ousting Robert Mugabe would have been easy and just. Mugabe’s demise could have been achieved more quickly and with less life wasted than any of the other interventionist wars. We are in Libya. Libya certainly has oil. Britain’s interest in Libya’s oil has made us, until very recently, happy to wink at Colonel Gaddafi or turn a blind-eye to him – Whichever action was expedient at any given moment in time. The charge against Britain goes something like this: If you care so much about democracy and the Arab Spring Revolution, why aren’t you intervening in Syria? And the answer goes something like: Syria is not a major oil producer. That is to say, perhaps it is not the pretty jasmine flower rooted in the ground causing us to kneel and embrace its scent – but the gloopy, viscous sound of oil beneath. Make of that what you will. I think part of our involvement in the Arab Spring Revolution can be explained by Britain’s utter confusion about what to do about Islam. British governments have made Islam an “issue” by encouraging mass-immigration from Islamic countries. With the terrorist atrocities committed against Britain by Islamic extemists, it is too painful to admit that mass-immigration – exacerbated by multiculturalism – has caused these problems. So politicians construct the lie that, yes, a minority of terrorist and jihadist Muslims are stirring up enmity towards Britain (and “The West”) but these rogues exist far away and over the sea. For this reason we must countenance the boldest of lies that British security is threatened in Afghanistan by the Taliban and Al Qaeda – Even though Al Qaeda had long since relocated to Pakistan, as evidenced by the assassination of Osama bin Laden in Abbotabad. Still, these geographical niceties aside, we do not face organised terrorist threat from abroad but from pockets of militant Muslims at home. It is most obtuse that we should wage unnecessary wars in Islamic countries while practising mass-immigration and multiculturalism at home. Isn’t this fundamentally self-defeating? It is as though we are admitting We’ve got a problem with you lot when you’re thousands of miles away in your own countries; but come to Britain and you’ll just love our zany booze culture and wacky sense of humour. Not only are we asking Muslims to pass Norman Tebbit’s Cricket Test but also The War Test: If there was a war between Britain and an Islamic country, who would you fight for? As most wars against Islamic countries are seen, not incorrectly, by many Muslims as holy wars (only natural for states whose identity is religious) it is not inconceivable that some would choose a Muslim country over an increasingly ugly and secular Britain. By the way, I am happy to have Muslims in our society. They might be the saviours of some of Britain’s conservative values. If a “Sharia Controlled Zone” really was about banning alcohol, loud music, drugs and whoring, I’d move there in a heartbeat. But it isn’t. These “Sharia Controlled Zones” are the result of decades of teaching the joys of multiculturalism to the extent that we have marginalised traditional British culture and religion then allowed culturally aggressive pockets of our society the opportunity to usurp our values. The Sharia Controlled Zones are merely the propaganda of the militants and jihadists (often under-educated, easily led people). If a Sharia Controlled Zone really existed then homosexuals and adulteresses would be stoned to death before a single off-license was closed. No, Britain needs a strong, conservative Christianity which would help integrate many Muslims who rightfully feel adrift in our vulgar society. A stronger, Christian Britain (and one with a better education system) would help to minimise the internal jihadist movement. There will always be some tension between British Muslim jihadists and their host nation because of Britain’s de facto support of Israel. Nothing much can be done about this. But what Britain could do is stop antagonising Islamic countries by waging liberal-interventionist wars against them. We are not powerful enough to bring about democracy; and we can only do it selectively anyway. Because of Israel, Britain is not stroking the jasmine petal of Syrian revolution. Our government knows that Syria is just a little too close to Israel for us to intervene. We can get away with Libya as we could get away with Iraq: They are far enough removed from Israel and Palestine not to trigger a full-scale war there. President Ahmadinejad of Iran would probably find this act of aggression by Britain far too tempting to ignore. He must be desperate for some proper action and not just spitting fury. As much as William Hague may fantasise about a democratic Middle-East and Mahgreb opening their trade-routes, obeying human rights and being co-operative with their Western friends, liberal-interventionism in Islamic countries cannot work. It cannot work because Britain is not powerful enough. It cannot work because the people of Islamic countries, in spite of the younger Facebook generation, do not want a Western-style democracy. But more than this, it cannot work because Britain (and the Western world, for that matter) only dares by gingerly intervening in Islamic countries that are not Israel’s neighbouring dominoes. 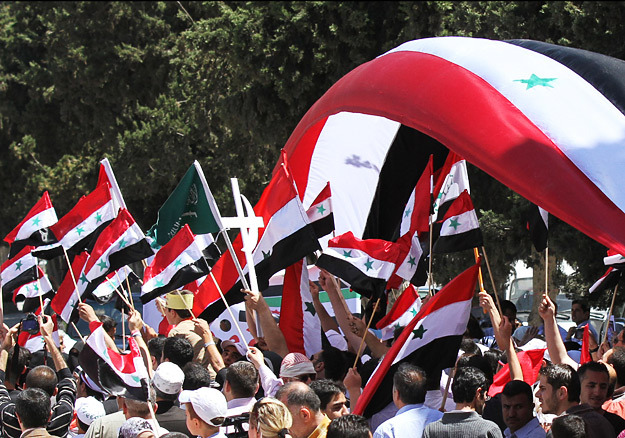 Syria is far too important for Britain to indiscriminately support the Arab Spring Revolution.